If you would like more information or to sign up for any of these, then you will need to directly contact the people who are running the sessions. Most sessions run during school term times only, but some are available throughout the year. 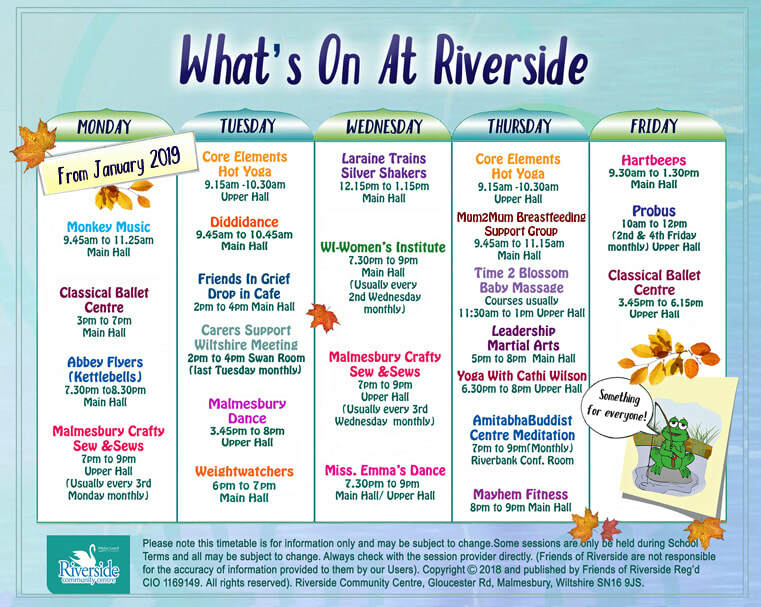 Friends of Riverside also run or host events and sessions, but these are shown separately on the WHAT'S ON AT RIVERSIDE page. Click here to find out more about the Amitabha Meditation Classes in Malmesbury and contact email details are epc@meditationinbristol.org Classes are on Thursday evenings. Meditation is described as "a powerful method to calm and focus the mind, thereby bringing deep inner peace and a sense of physical and mental well-being. Anyone can learn meditation. You do not need to be a Buddhist to attend the classes or to benefit from the techniques taught". Monthly meetings last Tuesday afternoon of the month. who couldn’t always manage without you?" CSW advises "... services include one to one support, befriending, complementary therapies, days out and breaks, plus free training courses, an online forum to connect to others, support groups and carer cafes." Classes on Monday and Friday afternoons. Bereavement is not something we generally like to dwell on, but it's something that touches most people at one time or another. Just come along on a Tuesday afternoon to FIG - a drop in cafe, where you can come along for a chat and a cuppa and be comfortable with people who understand or are going through a similar experience. A warm welcome awaits you. Click here for their website and more information. Frank holds sessions at Riverside on Thursday afternoons and evenings. 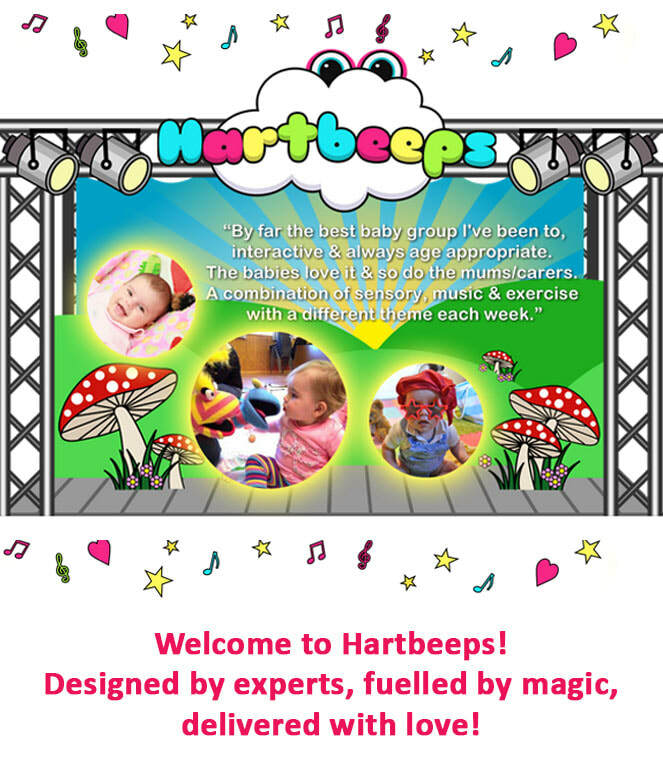 These cater for both adults and children. If you are interested in finding out more about Leadership Martial Arts, then please click here on the link to check out their website and contact details. Malmesbury Dance sessions are on Tuesday afternoons and evenings. The popular Malmesbury and Braywood Dance is run by Gill Woodforth and Sarah Brain. They offer energetic and fun classes in ballet, tap, modern and jazz for boys and girls aged from three years. Adult tap and Adult Ballet classes are also available. Further information about classes is available on their website. Click here for contact details and prices. A lovely informal drop in/ get together with other Mums on a Thursday morning - which usually involves cake or biscuits! "If you’re a breastfeeding mum or are pregnant and thinking about breastfeeding and need some support, advice or just a chat, then come along..."
Click here - Further information available on Facebook. On Tuesdays "... yes to weight loss success ... and if you’re tired of struggling with your current approach to weight loss... Simply pop into your local Weight Watchers meeting, hand in any materials from another weight loss plan and join the Weight Watchers family – it’s as easy as that!" WI in Malmesbury. Fun, crafts, friendship, resolutions, cooking, competitions, education, opportunities, campaigns. Lots to interest and friendly atmosphere! Meetings start at 7.30pm, usually second Wednesday in the month. Find Malmesbury WI on facebook or just come along! Enjoy Yoga sessions on Thursday evenings which aim to relax and energise. Yoga "brings vitality, flexibility, strength, concentration, self-confidence and mental calm... it helps you overcome stresses and strains, aches and pains and promotes a firm foundation of health and well being". Cathi is an Avon Iyengar Yoga Institute teacher. Please phone tel: 01666 823483 for information about her sessions.